Never run out of stock with inventory tracking in QuickBooks Plus. Keep track of every product you buy and sell. With QuickBooks Plus, inventory quantity is adjusted automatically as you work, so you always know which items are best-sellers, how many you have on-hand, and if your stock is getting low. It’s easy to organize products using images, categories, and prices. Do you need to manage multiple warehouse locations? Or track by bin location, lot, or serial number? QuickBooks Desktop Enterprise provides businesses with advanced inventory management features that make complex inventory tasks easy. Connect QuickBooks to popular online sales apps – like Amazon, Etsy, and Shopify – to keep your sales and inventory in sync. 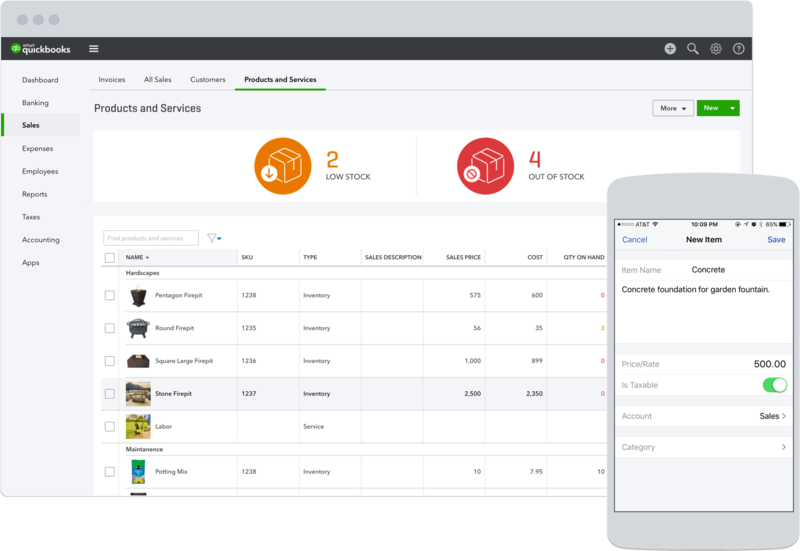 You can also connect QuickBooks to inventory management apps – like Stitch Labs, SOS Inventory, and Unleashed – for advanced inventory management. We’ll alert you when it’s time to reorder inventory by sending you low stock alerts. When you order new inventory, it’s easy to track your inventory purchases by product and vendor. Once inventory arrives, QuickBooks converts the purchase order (PO) into a bill to make sure you pay your vendor when you’re paying bills. QuickBooks Plus automatically calculates the cost of each product sold using first in, first out (FIFO). Inventory values are automatically adjusted in your balance sheet real time. QuickBooks Plus comes loaded with a variety of reports to make inventory tracking easy. Access the Inventory Summary report to see inventory on-hand, the Inventory By Store report to see inventory across multiple locations, and more. It’s also easy to run reports to see your best sellers, total sales, and total taxes. More than inventory tracking. Run your entire business with QuickBooks. QuickBooks automates standard bookkeeping tasks such as entering transactions, performing calculations, and organizing data to keep your books balanced. Use your phone or tablet to enter transactions, record expenses, invoice customers, send reports, and more – from anywhere. Accurately track and pay your bills on time with QuickBooks. Pay bills by credit card, by check, or via online banking, and set up automatic payments so that your bills are paid on time. When you connect your POS system to QuickBooks, your sales data automatically syncs so that your sales transactions are entered into your books for you. Every dollar coming into and going out of your business will be accounted for, enabling you to run accurate reports for better decision making. Watch this video to see how to track inventory inside QuickBooks. More than software. Learn how to grow your business. Whether your small business sells goods online or in-store, inventory plays a role in many profitability metrics. Read why a good inventory strategy is key to improving your bottom line. Inventory tracking software helps put managing inventory, a vital part of running a small business, on autopilot. Learn 3 key ways that inventory management software can help your small business. With Vendor Managed Inventory, also known as VMI, the vendor is responsible for maintaining agreed upon inventory levels for the buyer. It reduces the potential for supply chain errors, amongst other benefits. Learn how VMI can benefit your small business. What is an inventory tracking system? An inventory management system tracks the sale, purchase, and payments related to goods, raw materials, and finished products. Many inventory tracking software systems track inventory in different ways, such as by barcode or serial numbers, by radio-frequency identification (RFID), or through wireless tracking technology. How do you turn on inventory tracking in QuickBooks? Inventory tracking is a feature of QuickBooks Plus, so if you are using another version of QuickBooks but want to use the inventory tracking feature, then you will need to upgrade. Then, from the Account and Settings page, choose Sales and make sure that ‘Track quantity and price/rate’ and ‘track inventory quantity on hand’ are both set to On. We recommend you watch this video that shows all of the steps to getting started with inventory tracking in QuickBooks.